There are quite a few online resources out there for learning financial modeling and valuation. Coursera is one of those resources. Students often ask us, what do you think of Coursera financial modeling courses? Coursera provides courses on a wide variety of topics, even extending outside of business to the likes of software development and data mining. In the specific vein of corporate finance, however, Coursera has partnered with the Wharton School to offer a business and financial modeling specialization online. The specialization is taught by a combination of professors and costs about $600. The CFI Full Access Bundle, by contrast, is taught by a combination of industry professionals and teaching professionals, which delivers a powerful result. These professionals have industry experience that directly contributes to the applicability of the courses. The 15+ courses in the bundle cover not only financial modeling, but also valuation, sensitivity analysis, and industry-specific models. The above image is from CFI’s financial modeling courses. Additionally, CFI provides an abundance of free resources to complement the CFI Full Access Bundle. These resources range from articles on financial analysis, career choices, accounting policies and investment methods, to Excel templates for a wide variety of financial ratios and formulas. In fact, aspiring professionals who would like a sample of the CFI courses can access the resources at no charge and at any time convenient for themselves. Simply head over to the resources section to find links to the relevant articles or templates. For anyone looking to break into corporate finance, investment bankingInvestment Banking Career PathInvestment banking career guide - plan your IB career path. Learn about investment banking salaries, how to get hired, and what to do after a career in IB. The investment banking division (IBD) helps governments, corporations, and institutions raise capital and complete mergers and acquisitions (M&A). Analysts work 100, equity research, FP&AFP&A AnalystBecome an FP&A Analyst at a corporation. We outline the salary, skills, personality, and training you need for FP&A jobs and a successful finance career. FP&A analysts, managers, and directors are responsible for providing executives with the analysis, information they need to make operational, strategic decisions or other areas of finance, CFI is the best value for your money. The courses are designed in such a way that they can be tailored or bundled to fit the specific career aspirations or professional development requirements of the individual. But don’t take our word for it, check out the hundreds of reviewsStudent ReviewsDaily reviews and feedback from the thousands of students who take CFI courses to prepare for careers in investment banking, FP&A, finance, accounting... from our thousands of students who’ve advanced their careers by taking our courses. CFI also offers financial aid for those that are interested in taking the courses, but are just shy of the resources required to do so. To apply for this financial aid, please visit the application pageFinancial SupportCFI financial support covers financial aid, university scholarships, and charitable donations. Explore our financial support for your career and fill in the required information. Applicants should receive a response containing further instructions or results in a short amount of time. P&L templateProfit and Loss TemplateFree Profit and Loss template (P&L template) to download. Create your own income statement with monthly and annual versions in the Excel file provided. 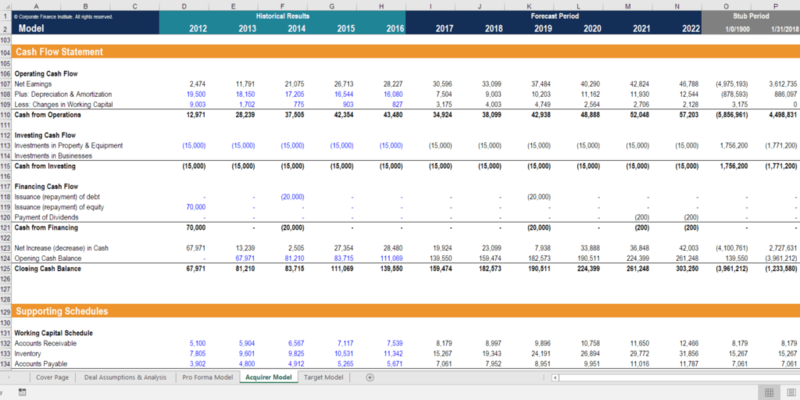 This P&L template summarizes a company income and expenses for a period of time to arrive at its net earnings for the period.